This procedure is extremely popular and can really change a tired looking face into a fresh, younger look. By eliminating bags and reducing droopy eyelids the surgery can open up the face and give a brighter appearance. The surgery is carried out under general anaesthetic and usually takes between 1 to 3 hours. 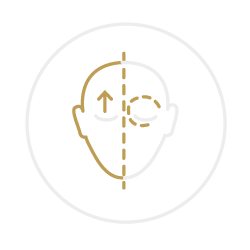 With both the upper and lower eyelid surgery a small incision is made and the excess fat, skin and tissue are removed before the area is stitched up. No, it will only be uncomfortable because of the swelling. Q: Will it affect my vision? Initially for the first 2 days you may experience slight blurred vision with watery eyes, this is a normal recovery process. Initially recovery period is 2-3 weeks to allow for swelling and bruising to subside, full recovery is normally 6 months.